I recently posted a summary of the Portfolio Rebalancing Software Panel from the Tools and Technology Today (T3) Conference that took place in Miami back in February 2012. The responses from the four vendors were very informative and I thought it would be interesting to hear from a few other vendors who couldn’t be part of the panel. 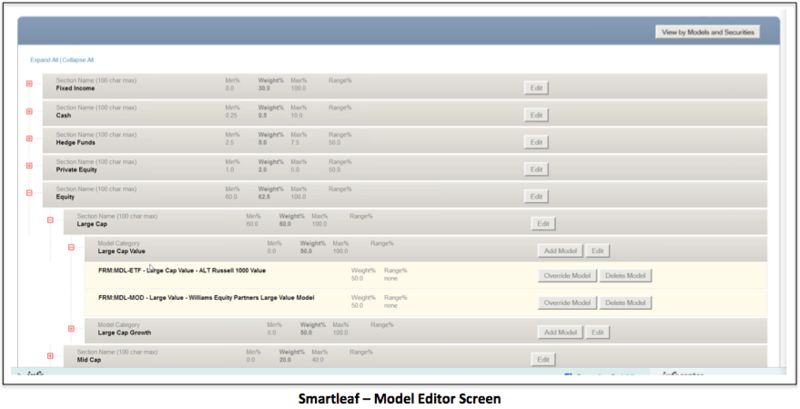 Another of the vendors I reached out to was Smartleaf. The company takes a very narrow product focus. They provide an overlay portfolio management system with only two components; an automated rebalancing engine and model management. They currently have more than 40 customers that run approximately $50 billion in AUM using their system. Some of their largest clients include US Bank, Peoples United Bank, BB&T, City National Bank, and Bank of Hawaii. (See my previous post FundFire: Bank of Hawaii Launches $2B UMA Program.) SmartLeaf was founded in 1999 and their headquarters is in Boston, MA. For this article, I spoke with Gerard (Jerry) Michael, the President and Co-Founder of Smartleaf. I asked Jerry the same questions that were posed to the T3 panel and he was gracious enough to provide the following answers. Smartleaf differentiates their product in three ways, Michael began. First, their product is focused solely on automated rebalancing. While they do provide features such as bulk order entry and other manual trading tools, they don’t believe they are required to implement an efficient workflow. Second, their system is designed to generate tax alpha. Third, the product’s aim is to minimize dispersion based on a combination of an account’s target asset allocation and its assigned model. Their product also helps advisors to manage their portfolios holistically by combining models into a single blended model for each account, he explained. Michael also pointed out that the Smartleaf system doesn’t utilize sub-accounts or sleeves, unlike most of the other rebalancers on the market. Each account contains all securities, all together. They refer to their system as “sleeveless overlay” or “blended-model overlay”, he noted. The companies that they most often run up against are Prudential, Vestmark and Citi OpenWealth, Michael responded. Sometimes Parametric could be in the mix since they have share the objective to generate tax alpha for their clients. However, since Parametric is an outsourcer, it would depend more upon the client’s business model rather than feature/functionality comparison between the two firms, he observed. How do you convince advisors who still rebalance manually that software automation can do it better? Can you provide some real-world examples of the efficiencies that your product brings? totally eliminates manual errors, while increasing the level of customization available. One Smartleaf client moved the people that were freed up from manual rebalancing in front of prospects and wound up doubled their sales, Michael proclaimed. They also reduced the time required to implement a tactical asset change from months down to just one day, he said. When advisors are asked how much time it usually takes to implement an investment policy change, the standard answer is usually between two weeks and never, Michael revealed. This is often due to the tremendous amount of customizations for individual clients as well as the complexities of tax management. Both of these issues are resolved when using Smartleaf, he pointed out. Another success story Michael related was an investor-facing portfolio manager (also referred to as Rep as PM), acting as the overlay manager, who was able to triple the amount of time available for him to spend with clients, prospect and influencers. He eventually quintupled his book of business and was also able to launch an open architecture product offering, he said. The only two points of integration are with the client’s portfolio accounting system (i.e. Advent AXYS, Sungard, SEI Trust 3000), which sends the daily positions file, and their trade order management system, which receives the generated trades from the rebalancer, Michael explained. This way there is no reconciliation required, which differentiates Smartleaf from other systems that require shadow portfolio accounting, he emphasized. EnvestnetTamarac: Which Portfolio Rebalancing Software is Right for You? FolioDynamix: Which Portfolio Rebalancing Software is Right for You? Their product pricing is based on the size of the client and the percentage of their assets that are following third party models, Michael emphasized. Their minimum fee is $50,000 per year and their target clients have AUM between $1 billion and $20 billion, he stated. Once 15-20% of a client’s book of business is following third party models, it usually goes over the annual minimum, Michael pointed out. The cost of their system then becomes entirely a pass-through, which works well with the budgeting process at most wealth management firms, he noted. According to Michael, implementing an open architecture platform with blended-model overlay using Smartleaf is more efficient and costs less than half of what most actively managed mutual funds charge and a third less than most separately managed accounts. Adding the cost of their platform with the cost of third party models usually comes to no more than 50 basis points. This results in a much less expensive product for the end investor, he said. No. However, due to the efficiencies of their system, Michael asserted that client portfolios run by Smartleaf have half the dispersion of those run using systems with real-time prices. Other firms focus unnecessarily on real-time execution and rush to implement trades as soon as a manager changes their model. Michael considers this to be the traditional model-based workflow, which would also include some regularly scheduled global asset class rebalancing. This approach leads to very different operational results than the method recommended by Smartleaf, he stressed. They prefer a more holistic approach that only generates trades for a portfolio when there is a good reason to do so, Michael stressed. Some examples of good trading reasons would be asset class or security level drift, significant model changes, wash sale period expiration, etc. Their system is efficient and will often use a single order to correct both product and asset class deviation. It will hold trades if their timing isn’t right, such as with positions that are close to the long-term capital gains cut-over date, he said. No. Their system is designed solely for the implementation of client strategies, Michael said. SmartLeaf doesn’t support short positions at the present time, Michael reported. However, a user could create an unmanaged category to represent their short positions, similar to how a municipal bond strategy would be handled, he noted. If they the client has all of the information regarding their end investors’ personalizations and portfolio customization requests, then the system can be implemented in as little as 4-6 weeks. 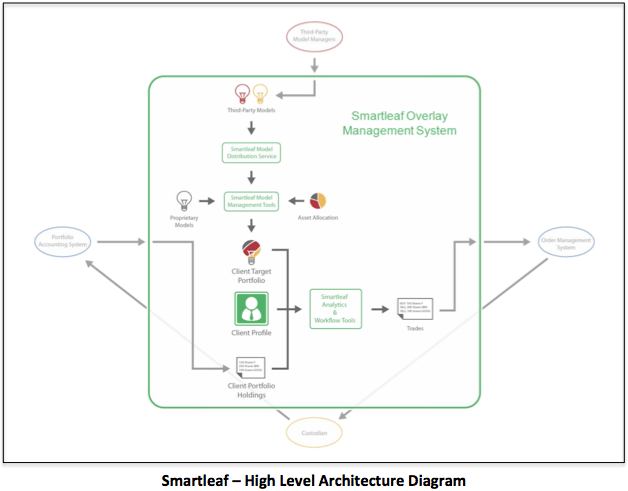 However, this usually isn’t the case and Smartleaf usually has to work with he client to perform the necessary data gathering process. The result is that the average system implementation runs between 3-6 months, but most of the time is spent setting up a profile for each portfolio. Sometimes it requires an entire cycle of client meetings to gather the necessary information, Michael noted. Michael believes that rebalancing should be done whenever it is most beneficial to the end investor, given consideration of tax, trading costs, drift and return expectations. Smartleaf analyzes every portfolio daily, comparing the portfolio’s current holdings and asset allocation to its target holdings and asset allocation. The system will then suggest actionable, pre-trade compliant, tax and expense sensitive trades that keep the portfolio in line, he reiterated. Yes, and in a way that permits users to create custom models-of-models without creating an ongoing maintenance burden, Michael pointed out. Custom models-of-models remain tied to the original firm-wide baseline version, and if the baseline version is updated, the changes cascade down to the customized variants in a way that preserves what was customized, he stated. Smartleaf is offered as a hosted service, Michael explained, which includes hosting, updates, data services, etc. This includes 24/7 support to ensure that all interfaces are operating correctly. They also adopt a “train the trainer” approach to training and application support. The idea is to provide unlimited support to local Subject Matter Experts, who then take on primary support responsibility for others in their firm, he said. Are there any other features that set your product apart from your competitors? 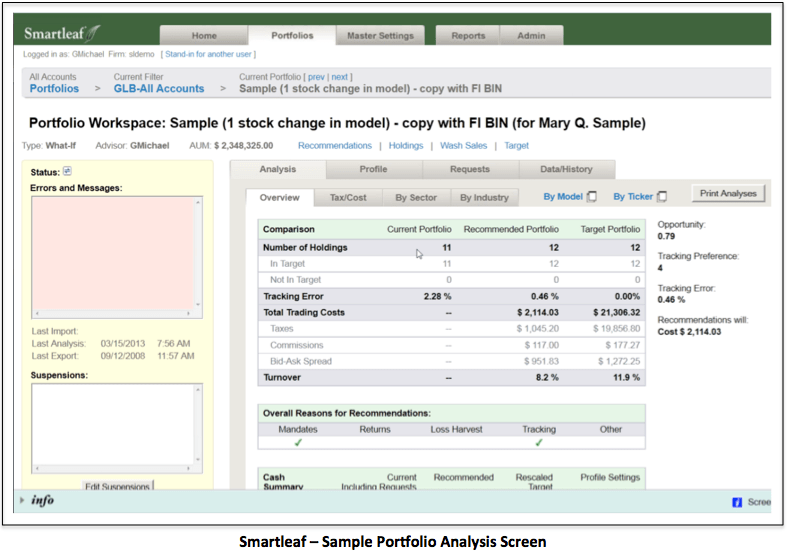 Target templates model management–customized models-of-models that still follow the firm’s master copy. This enables every account to have a custom target without hindering the efficiency of consistently updating asset allocations or switching models. Documentation of value delivered to the end investor. They want to enable their clients to better understand the benefits, especially the tax alpha, that their system delivers to each end investor. Smartleaf clients do a better job of managing taxes and controlling dispersion, Michael claimed. They want to help them clearly make this case in the marketplace.